Heralding New Year's Eve with fireworks in Old Montreal is an annual tradition in the city, a Montreal New Year's Eve event attracting in the upwards of 70,000 people of all ages interested in ringing in the new year in a festive, outdoor setting. On New Year's Eve, starting at 6 p.m., the Old Port and Place Jacques-Cartier come alive with Montréal’s biggest New Year’s Eve party. At the stroke of midnight, marvel at the fireworks and the illumination of the Jacques-Cartier Bridge and dance the night away until 2 a.m. to the sounds of the DJ. The crowd converges at Jacques-Cartier Pier (map) for this free event. The closest subway station to get there is Champ-de-Mars Metro. The safest and surest way to get to and from the Old Port is to take public transportation. The Société de transport de Montréal will keep the Metro open all night for New Year's Eve. Unlimited evening passes are available for $5, which gives users unlimited access to public transit from 6 p.m. to 5 a.m. Night buses will also run on schedule, and the Montreal Casino bus #777 will be shuttling gamblers from Jean-Drapeau Metro station to the Casino and back all night long as well. Reaching the area by car is not recommended on New Year's Eve given the crowd size and insufficient parking to accommodate 70,000 revelers. However, there is paid parking in Old Montreal. Go early to find a viewing point. The New Year's Eve fireworks event attracts up to 70,000 people primed to ring in the New Year and is one of the more family-friendly affairs in the city with the crowd skewing around ages 18 to 45. Dress warmly and in layers. It's bound to be cold, and excessively inclement weather could close down some of the events. If you're headed to the area for fireworks, you might as well enjoy the other festivities happening before and after the show. Here are some other ways you can celebrate the New Year. Another activity to consider before heading down to the fireworks is attending Mass at the Notre-Dame Basilica. Consider going to Marché Bonsecours, one of Canada's 10 finest heritage buildings, which has become an essential stop on any visit to Old Montréal. The Marché houses 15 boutiques featuring Quebec-made creations: crafts, fashions, accessories and jewelry, design items, reproduction Quebec furniture, and more. There is also a selection of restaurants. Throughout the evening, the Old Port skating rink on Bonsecours Basin is open for business, complete with skate rentals. The public can even skate on the ice after the fireworks until 2 a.m. on January 1, 2019. Find out details on admission and skate rental prices for 2018 and 2019. If you're going to hit the ice, remember to bundle up because it gets windy at the Old Port, which can make the night feel colder than the actual outdoor temperature listed on weather websites. 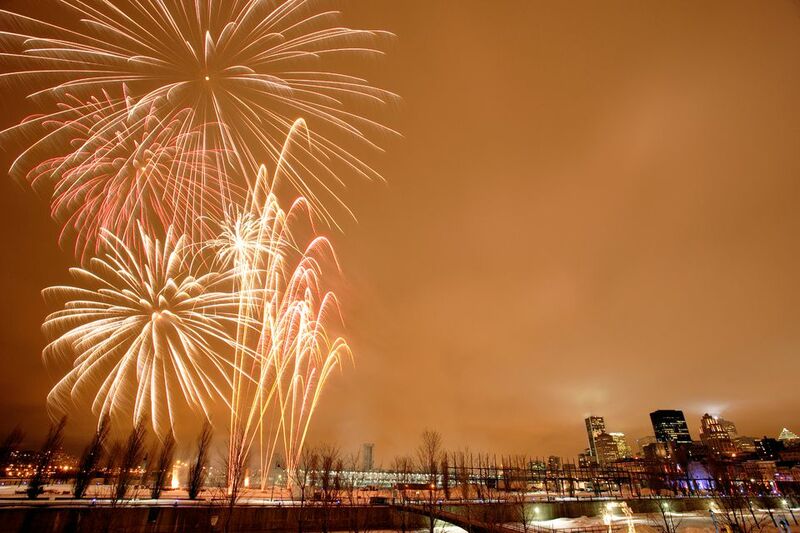 There certainly have been fireworks in other locations in years past, like at Montreal's Winter Village at the stroke of midnight however, at the time of publication, no other events have been publicized.